EUGENE Oregon—(Weekly Hubris)—April 2019—In March, pretty much all across the country, robins start showing up anywhere there is a bit of grass newly bared by melting snow and likely to be soggy enough to get a beak into. The birds simply appear from wherever they’ve been hanging out during the winter, moving in squadrons across any available green expanse, eager to resume their favorite diet of earthworms after a long winter of (ugh!) berries. 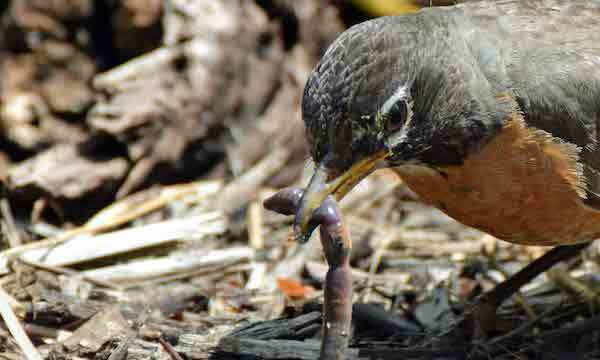 Meticulously, these groups—(unlike geese, larks and crows, robins have yet to commandeer their own noun of venery. A bobbin of robins, perhaps? A fund? The birds do seem a bit like bankers, each one with its plump tummy leading the way—the most stolid of all the thrushes. 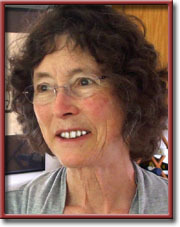 )—meticulously, I say, they work the territory, scanning the ground for any signs of recent worm activity. We have all seen the classic pictures of the persistent bird struggling to pull what looks like a piece of elastic out of a tiny hole, bowing its neck, hunching its shoulders as it yanks and yanks—until the final “Boing!” of victory! Gazing absentmindedly out the window at a working crew of robins recently, I watched one suddenly break loose from the regiment and take off, rather rapidly for a robin, a worm dangling so long from her beak that it was bouncing onto the heads of some of her fellow laborers as she skimmed past. I heard a kind of collective “Yawp!” from the other birds. One or two of them halfheartedly raised their heads and made as if to pursue her, but it never amounted to real sabotage. The triumphant bird sailed off with her lunch-to-go firmly in her control. This made me feel good, because I was witnessing an example of raw, unadulterated sufficiency tipping into joy. This robin was healthy and soon going to become even more so. She was about to affirm the rightful order of things by peacefully partaking of a meal she had earned, thus assuring the survival of herself, her progeny, and the entire robin clan into the near future. Isn’t there something deeply wrong with this picture? Yes, because it’s probably true. Those of us who take scientists like Guy McPherson seriously, we know the days of Happiness by Worm are on their way out. It’s enough to turn you into a raving maniac, into a person who comes out to yell at robins and then goes inside again, laughing. If this were the right movie, I might be whispering up to the raven, “And What Will the Robin Do Then, Poor Thing?” as the lights come up on the piano at the front of the stage. 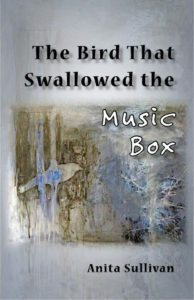 To order Anita Sullivan’s book, The Bird That Swallowed the Music Box, click on the book cover below.